Happy Wednesday! Good morning, and thank you for joining us for another episode of #ThatBusinessShow on #1250WHNZ at 8am! Remember, if you missed the show on the #MorningAir, then head to http://www.tampabayadio.com to catch the show on demand! Every weekday at 8am, our Host, Jamie Meloni, and the #ThatBusinessShow team work to bring people on in our community that make a difference. From Entrepreneurs, Businessmen and women, people who work for a noble cause, and all the way to people with great talent – #ThatBusinessShow is here to showcase your business and your talents to the community! And as it’s Wednesday, that means it’s #WorkingWomenWednesday here on #ThatBusinessShow! Bringing on guests from The Working Women of Tampa Bay Group, CEO and Founder Jessica Rivelli was on the #MorningAir first, calling in to give us some info about her newest upcoming events, all about which you can find out more about at http://www.workingwomenoftampabay.com/, including the Women’s Pay Equity Seminar at The Tiger Bay Club in Tampa on Friday, November 20th! Coming up from The Working Women of Tampa Bay Group first was Debbi Stone, Vice President of Education with The Florida Aquarium! Coming up on our last segment was Chris Field, Former Fox 13 Anchor and current Founder and Owner of Studio Physique – Lagree Fitness! If you missed the #MorningDiscussion, then head to http://www.tampabayradio.com, or head to Jamie’s YouTube Channel at http://www.youtube.com/jamiemeloni to watch the show on demand, and leave a thumbs up! Our first guest coming on the show was Debbi Stone, Vice President of Education with The Florida Aquarium! Starting her career as a middle school educator, she transitioned to informal science education at Mystic Aquarium (CT) before relocating to Florida in 2000. At The Florida Aquarium, Debbi oversees all aspects of education including standards-based school programs, outreach, teacher workshops, community programs, on-site visitor programs, camps, and overall departmental growth at an informal science center. She is a frequent speaker at local, state, and national conferences and is Past-President of the Florida Marine Science Educators Association. Debbi spoke to our listeners all about the programs and special activities the aquarium has to offer, including diving with sharks! Sharing with us an adorable story with school children, this was one segment of #ThatBusinessShow #WorkingWomenWednesday Edition that you don’t want to miss! So head to http://www.tampabayradio.com now to catch the show! And visit http://www.flaquarium.com for more information on your local aquarium! On our last segment, Jamie Meloni welcomed Chris Field, Former Anchor and Sports Anchor with Fox 13, and Current Founder and Owner of Studio Physique – Lagree Fitness. Describing the fastest growing workout, sweeping the globe, the Lagree Fitness Method! “Lagree is often described as “Pilates on Steroids”, “Pilates on Crack”. Lagree is the evolution of Pilates – more intense with more strength training and cardio. Lagree encompasses the 5 elements of fitness: cardio, strength training, balance, flexibility & endurance. We target slow twitch muscle fibers with slow moving exercises on spring-loaded machines called Megaformers. The workout is low impact, yet intense. Lagree is gentle on the joints, great for connective tissue, the spine and posture – ideal also for people with injuries. People of all fitness levels can participate: we have elite athletes working out alongside people taking their first fitness class in years.” With the benefit of the “Boutique” Fitness, once a person tries the method, they get hooked by the work out, and the community within the Studio! With more information at www.StudioPhysique.com Under “Media”, you can find out all about the Lagree Fitness Method, and if you missed Chris live on the air, head to http://www.tampabayradio.com now! Show Recap – Healthy Living and St. Pete Wine and Food Festival with Dawna Stone and Craft Brewing with Leigh Harting! 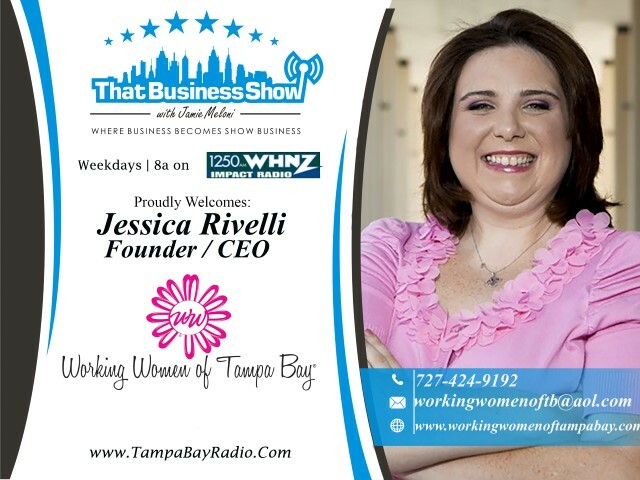 #WorkingWomenWednesdays was featured today on #ThatBusinessShow and CEO/Founder of the Working Women of Tampa Bay Networking Group, Jessica Rivelli, checked in at the top of the hour. Jessica spoke of updates to the Working Women Conference being held September 10th and 11th at the Straz Center in Tampa and encourages all listeners to use discount code Meloni2015 for tickets to the event. This is a great networking event and attracts many participants and learn more and pick up tickets at http://www.workingwomenconference.com and learn more about this influential and very active group at http://www.workingwomenoftampabay.com! 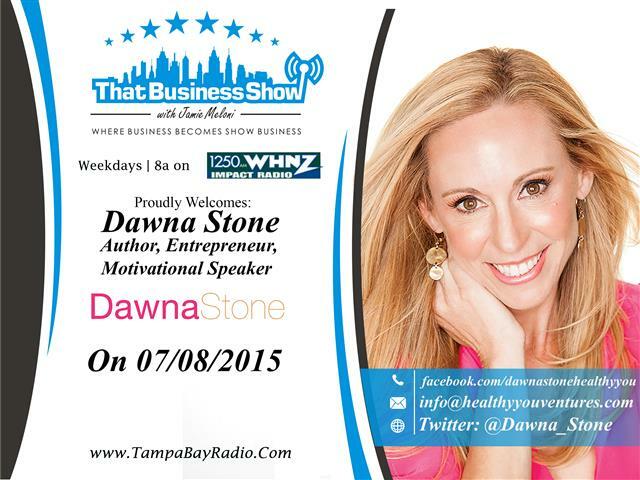 My 2nd guest for the show was author, speaker and health/wellness expert Dawna Stone. Dawna opened up the discussion with a promotion for the St. Petersburg Wine and Food Festival, an inaugural festival she is promoting and being held in Downtown St. Petersburg September 24th to September 27th and will feature many great area restaurants and breweries and wine connoisseurs. Tickets are currently on sale and there are VIP packages along with sponsorship opportunities available at http://www.stpetewineandfoodfest.com, learn more at the site! Dawna then spoke of her recently released book, The Healthy You Diet : The 14-Day Plan for Weight Loss with 100 Delicious Recipes for Clean Eating. Dawna has an extensive background in health and wellness including the founding of Women’s Running Magazine and the Women’s Half Marathon Series, both of which she founded and sold to the industry leader after developing the brand. Dawna gives listeners some great health and wellness tips in this segment and we share a discussion of some of my health vices including diet soda and fast food. Dawna has some solutions and recipes for the on-the-go business professional in her book and the book is available at Amazon.com by clicking here. Dawna also touches briefly on her role as Martha Stewart’s apprentice, a position in which she won on the NBC show in 2005 “The Apprentice: Martha Stewart” This impressive feat opened up many doors for her including a radio show on Sirius Satellite Radio that she hosted for a year on wellness. Dawna is an excellent resource for healthy living and be sure to check out her book on Amazon and she is available for speaking engagements. Reach out to her via email at info@healthyyouventures.com! On the 2nd half of the show, Leigh Harting, Owner and Sales and Marketing Director of 3 Daughters Brewing, joined the show. This locally owned craft brewery is located at 222 22nd St South in St. Petersburg and is open 7 days a week. Featuring a tasting room and many weekly entertainment events, this brewery is both a place for friends to hang out and for family events as well. Many events each week are focused on children and you can even take tours of the brewery and see have beers are made. Leigh shares the story of their development in craft brewing on this segment and touches on some of their beers including the popular Beach Blonde Ale, available in many storefronts across Florida. They also share a partnership with The University of South Florida which has a Brewing Arts program designed for people interested in breweries and they take on interns from the program throughout the year. Learn more about this program by clicking here Leigh also shared with us some of the plans for the company regarding expansion and their upcoming “My Hero Series” which will be launched on Veteran’s Day which will be an annual beer celebrating a “Hero” on the can. Be sure to learn more about this great local business at http://www.3dbrewing.com and reach out to Leigh at 727-495-6002 or leigh@3dbrewing.com for more information!